Fujitsu Q702 Windows 10 Tablet/Laptop Core i5 1.8ghz 4GB Ram 256 SSD Win10 Free Keyboard,Stylus & Sleeve! Home » Fujitsu Q702 Windows 10 Tablet/Laptop Core i5 1.8ghz 4GB Ram 256 SSD Win10 Free Keyboard,Stylus & Sleeve! CFU Ltd, Albion Mill, St Marks St, Bolton, BL3 6NR. We have 100's of laptops in stock, come visit our showroom! 256 SSD (solid state) for faster boot and speedy access times Plenty of storage too. 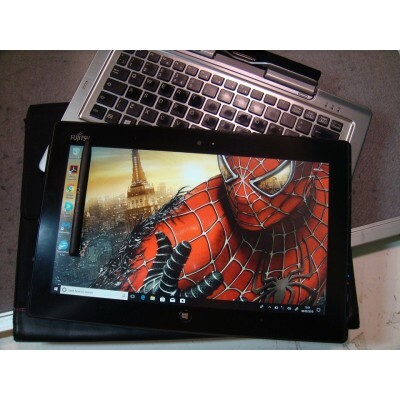 These particular tablets/laptops are in excellent working order and reasonable cosmetic condition. They do have scuffs and scratches to the casing and wear to the keyboard as have been highlighted in the photographs. There are also some very minor white pressure marks within the screen itself but these are hard to see, especially on a picture background, and do not affect the performance of the tablet/laptop in any way. This is all reflected in the bargain price!! Please contact us before you buy if you have any queries as to the condition as the cosmetics are NOT covered by the warranty. Please note that we supply these tablets with the case that they came in to us. They are used so may be a little scruffy but they are FREE and extra protection when packing! Item is sold pre-loaded with genuine Windows 10 (from original Windows 7 with certificate of authenticity attached to the laptop). Please note that due to the Windows 10 upgrade, the volume control will only work within Windows and not with the controls on the tablet itself. All laptops that come to us have the hard disc fully erased, then a fresh install of the operating system applied. We then do all the Windows updates and pre-install all the drivers, so the laptop is ready to use out of the box! Please also note that both the tablet section and the base section have a battery which we have tested but as with all batteries, we do not warrant! We test all batteries to run for a minimum of 30-45 minutes. Most will last significantly longer but if you are in any doubt please speak to us BEFORE YOU BUY. We supply this used laptop with a 90 day RTB (Return To Base) warranty. The warranty covers the hardware only, we do not warrant software or batteries. All laptops have been fully tested before being sent out. We check the batteries to work for a minimum of 30-45mins and most last significantly longer. However we provide NO WARRANTY with batteries*. We will post the item using an economy tracked and insured service. *Please note that all deliveries are Monday to Friday only and do NOT include any weekend deliveries. We will post the item within 1 working day, for example if you buy on a Friday, Saturday or Sunday after 1pm, we will post on Monday. Buy on any other day and we aim to get the item out same day if purchased before 1pm, otherwise item will be sent next business day. We welcome viewing/collection/purchase at our Bolton shop, where we have over 60 laptops on display!! *We provide no warranty with batteries. Fujitsu, Q702, Windows, 10, Tablet, Core, i5, 1.8ghz, 4GB, Ram, 256, SSD, Win10, Free, Keyboard, Stylus, Sleeve!